Discussion in 'Multihulls' started by Doug Lord, Nov 18, 2014. Although the rudder rake is synchronized as standard, the rudder rake system has already been separated in a port and starboard system to -eventually- offer rake differential at the rudders. Customer boats will not feature this ex-factory as yet, although DNA team riders will feature such to test the structural integrity of the various masts currently available during the 2018 season. Rudder differential will increase righting moment and thus speed, however loads on the rig go up too and we do not want to see customer masts failing. Pretty cool layout/design solution with the traveler track on the trailing edge/bottom of the rear beam. And the mainsheet purchase system hidden between the tramps. I think that is brilliant. Not only does it prevent dust from falling into the track/traveler/blocks. It also prevents things like clothes from getting stuck in the traveler. Not to mention the uncluttered deck layout, and the aero advantage, which I guess was the main reasons behind this solution. Only the argument of less dust exposure should be enough to consider putting it on other boats. Even though I've never sailed these boats, I remember finding a video of the release of the first DNA F1, and thought it was just amazing. I loved that they had put so much effort into the aero. I mean, even the steering bar is part of the aero shape! And this revision looks even better. Just a teaser from the official fb web of the D35 Trophy. A new D35 foiling platform equipped with T foils. When allowed to be distributed we will have all the details as usual. "Befoil 16 is a foiling catamaran for sailing schools and beginners. It's safe, accessible and simple. 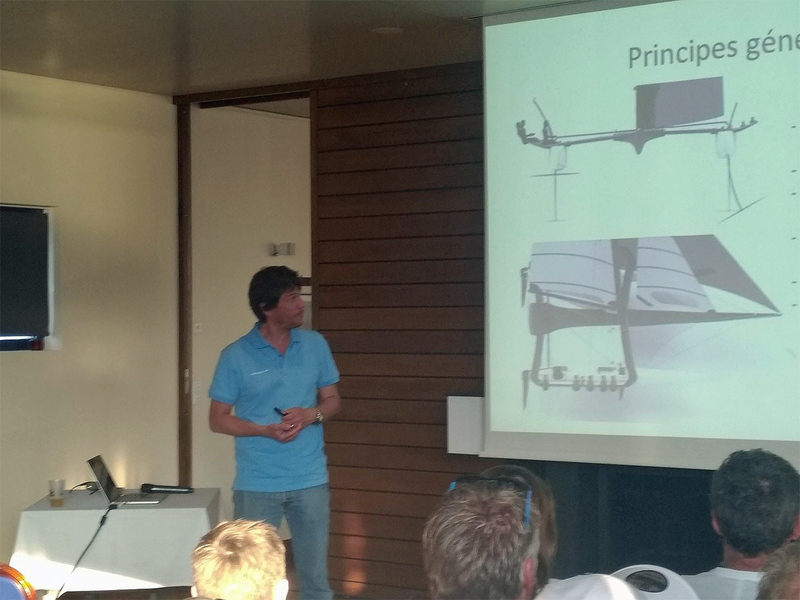 Together with naval architects from VPLP we created a foiling boat that can be used by almost anyone - teenagers, sailing schools members and visitors or people on a holiday in a vacation club. Another goal was to create an accessible foiling boat - so that even sailing schools could afford it. By using low-cost fully recyclable materials such as thermoplastic for the hulls and aluminum for the foils, we manage to keep a low price while making a robust boat." Doug Lord and Corley like this. The nexus of global monetary inflation and diminished demand due to a shrinking market of people willing/able to get into hobbyist sailing. After coaching the American Sonar Paralympic team to a silver medal at the Rio 2016 Games, Mike Ingham continues to work with the US Sailing Team toward Tokyo 2020. His task now is with the mixed multihull event in which the US finished off the Rio podium in 8th. Scuttlebutt editor Craig Leweck checked in with Mike for an update. The Nacra 17 was newly designed and selected as the multihull equipment for Rio, so the lead up to the Games was all about sorting out how to sail the boat. But now with the foils being redesigned, are we starting over again? Yes and no. There’s certain aspects that are the same, but the downwind is completely different. The boat was initially designed before foiling became widespread, so the new foils now lift the boat but there are still limitations in how you can adjust the foil angle. For example, the Moth has the bow wand that automatically changes the foil’s angle of attack to promote level flight, but the Nacra doesn’t have that feature. While there are adjustments, you can’t do it on the fly so you must rely on crew weight. To trim the centerboards, which are your lift agents, the sailors are running up and down the hull. It’s really interesting, and part of the reason it’s full on. They’re just moving all the time. So the learning curve continues? Yes it does. For example, in most boats, when it gets crazy windy downwind and everything is out of control, you typically move back in the boat as far as you can. You get the bow up and ease the sheet to keep from plowing into the back of waves. But in the Nacra, you do the opposite. When you’re ripping along and all of a sudden, the ride height’s too high, you must adjust the foil angle which means moving forward and trimming in to get the bow down. If you ease the sheet and/or go back, the bow goes up and the whole boat can get launched and then land very hard. So it’s against every instinct you have. You run forward and trim in when conditions are at their worst. Before the foils were changed, there was some lift but there were also some control problems. Have the new foils helped with safety? The previous blade design allowed for skimming, which reduced displacement but did not fully lift the hulls from the water. And, as you note, there were at times control problems which could lead to some massive wipeouts. With the newly designed lifting foils, it’s offered more control over your ride height. Before you could only skim, and if something went out of control, the boat could get very unpredictable. What the boat lacked was the elevators in the back to provide stability. Now, along with newly designed centerboards to provide full flight, there are T rudders which have the horizontal foil on the bottom. So the beast has been tamed and the achievable speeds are very impressive. My RIB with a 70hp outboard can be flat out and struggle to keep up. The boats are very fast, but that does heighten the safety issue. The horizontal foil of the T rudder is very sharp and adds an element of danger. If you fall off, you can get run over as the rudder foil sticks out beyond the hull. It is hard to be perfect all the time, and fast boats have a tendency to stop fast too. There’s two things that can lead to failure. There’s cavitation and ventilation. Cavitation is essentially when the water boils. That occurs at very fast speeds, but we’re not going that fast. However, ventilation is air coming down from the top and we do that. When that happens, we come off the foils and come crashing down. You don’t stop completely. You’re still moving when you come down. We call it a splat cause you’re foiling high and then all of a sudden you slap the water with your hull but you’re still moving so it isn’t violent. But sailors are still getting injured, which we saw when 2016 Olympian Bora Gulari sliced his hand when getting flung forward. There are exceptions. He stuffed his bows pretty hard, and when the boat stops the sailors can get flung forward. The failure mode for the foiling isn’t often a hard stuff but that time there were some variables that went against him. When the boat stops, the sailors are still going 25 knots or more and everything in front of them poses a threat. When things go wrong it can be violent, so we’re paying attention to what we wear out there to prevent what we can prevented. Helmets and wetsuits are standard and we’re working on improving the body armor to increase protection. However, it is hard to predict where the body may collide so it will be hard to fully eliminate risk. With the possibility of injury, we’re prepared if something goes wrong. We carry the first aid equipment and have the training, but we’ve just done three months of hard training and there’s been no problems. The other day we were getting puffs in the upper 20s, with speeds at about 27 knots, and there was no danger. We’re learning a lot about how to sail the boats really well that I don’t think we understood before. Can this catamaran be saved? propeller size for one-off 48ft catamaran build ?